I was recently tagged to do the 'Shopping Habits' quiz so here it is. If you want to take part just copy the questions, publish to your page and tag at least three other shopaholics. I was probably around 9 years old. I remember asking my mum for clothing catalogues and the Argos catalogue so I could tick which items I would be getting (if I ever had any money). It all kind of went downhill from there. It varies on what I've bought. If there is something I've been wanting for ages or something that we need for my sons or the house, I feel great. If it's a spontaneous buy or something that is expensive or just for me, I feel guilty. Not sure why, I suppose it's a mum thing. Urban Outfitters - Kooky style, unique items and they seem to always have something that I 'NEED' in my life. Next - I love Next I really do, as a petite lady Next always caters to my short whims. I adore each seasons styles and the home decor items are so on trend that you can't not love them. As a family of 5 I love that we can go to Next, get hubster something, get the kiddies kitted out and get something for the home and myself in one trip. Amazon - I'm a book wh@re plain and simple. Believe it or not when it came to the whole Amazon tax fiasco, I actually said to my husband that the government should let them off so I could keep buying cheap books.... selfish I know. Etsy - I support handmade. As a crafter (sewing & misc) I like to support my fellow creative types. I also love the versatile items you can get and you can literally get anything on this site. I use to be an avid user of the old alchemy system, where you could request your own custom items. I'm actually gutted they done away with it. & Other Stories - As apart of the H&M family I automatically knew I would adore this company. When I browse online I really feel as if they have scooped up my personality and created it. I love the innovative ideas, dainty but crisp fashions and the right amount of colour and embellishments. This company is one of those companies that you can shop from, but never look bad. Tough one as I have a lot of similar items. I tend to live in leggings, dresses or trousers. Vests are a staple and in the house lounge wear and slippers are my uniform. I'd say I have equal amounts these garments, I'd have a wardrobe especially for my comfy PJ's and lounge wear if hubster would let me, but nope he won't. 5. What’s the most you’ve ever spent in one shopping trip? About £700 but it was for Christmas and with young kiddies it was one of those trips that didn't result in shoppers regret. Oh actually I lie, we spent over £12k on a car paid in one go which was a huge shock to the system but a necessary purchase at the time. Always, especially when I'm buying something for myself. If it's an item that I don't 'really' need. It's a mummy guilt thing I think, I'm always thinking it's selfish especially when the money could have been saved for a rainy day or spent on the kiddies or hubster. I tend to use sites such as Topcashback or Quidco when buying items or shop via Shopcade as I can earn money over on there too in a similar way to Quidco, I also tend to add the items I feel I need or desperately want to a board and then let it sit for a few days. If I still feel that I must have that item then I know it's worth getting. I tend to buy lots of things I regret. The last thing was Japanese Mochi. I have been hearing so much about mochi recently and have seen them online but never in person. Mochi ice-cream, mochi cakes and mochi peanut butter flavour was what sold them. I did buy 2 different types of packs from Ebay and to be fair they really weren't cheap. They were delivered I tried the peanut one and it was ok, strange but ok. I then tried another and went ' Oh hell no!' and spat that beast out. It's basically a stretchy dough with flavouring inside it. It's squidgy and well, strange. Do NOT try the black bean one it is gross, just a heads up guys. New bedding, accessories or dresses, shoes and makeup. Please don't make me choose just one. No never. Everything I buy is usually different in some way. I tend to stick to trends and of course what suits my body shape. I think if I bought 2 or more of the same items it would be a waste as I know I get bored so easily. I tend to do most of my shopping online and can't remember the last time I used a dressing room. If I was buying something, say in my local Next then I would use one just to check that the item fits correctly. I use to love shopping with my friends but now as a mum everything is about time and organisation. I rarely have a few hours to myself to do anything and when I do it's spent at meetings, blogging, swatching or photographing products, oh or walking our puppy. Jeannie Mai. She never fails with fashion in my eyes, she also comes across as being really down to earth and a heap of fun. That shopping trip would be totally awesome. 13. 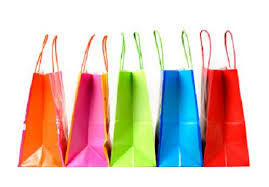 If you could go shopping with a Blogger/Youtube Blogger who would it be and why? It would be Annabelle Fleur from Viva Luxury blog. That woman's fashion sense is incredible and she seems like she would definitely inspire me with what to purchase. 14. What’s your favourite treat, snack, drink during or after shopping? Coffee especially iced coffee's with a vanilla syrup for sweetness. Cake always goes down a treat too, especially pecan swirls. 15. What is something you’ve always wanted to buy but never had the money to do so? Oooh good question. Probably a blue Ulfaria Malene Birger dress. It's within reach but I know it would cause major spend guilt afterwards. A camcorder and new laptop for sure. I keep all of my 'wants' on varied boards over on my Shopcade, this helps ease my need for shopping by making me feel as though I have shopped. When I'm ready to save or splurge I head over to my boards and shop without the guilt knowing it's on items that I really want. I'm a proud thrifty shopper.